Dear Tahoe, I have loved you for 26 years, have breathed in and danced in your sunsets and sunrises, walked the shores hiked in the woods and felt a profound sense of oneness and balance. There is no other feeling that I have ever experienced, watching the moon rise over the lake, as ducks and geese fish in the water. When I leave for several days and then return home, driving east up 80 past Blue Canyon, the smells change and the feeling of coming home washes over me and calms me, no matter where I have been. There is no place like home. Over the last few years, it has become increasingly more difficult to make a living wage here in the basin. Is it because of the economy? Maybe. Is it because of the climate changes and lack of snow? Maybe. Tahoe is a small town, part play and part work. Why is it that 20-something-year-olds and out-of-towners and out-of-country folk can find work — oh I know, they don’t ask for much as far as wages go, that must be it. Do I sound bitter? 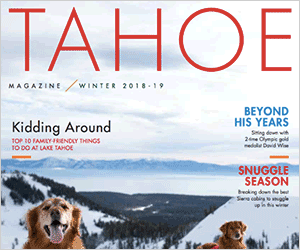 Really I am not; I am just heart-broken by the lack of work for we longtime Tahoe locals, and it is certainly not for lack of trying. I apply and apply and apply with no luck. Why is that when a person such as myself applies for a job on line and goes through the proper channels, I rarely hear back, sometimes yes, but rarely not. No “thank you for your inquiry,” not an “I’m sorry the position has been filled,” not anything. So I sit here, thinking, I am 52 years old, with so much experience in so many work arenas, with degrees and published books, and alas, I am still sitting. I spend an average of four to six hours a day online, craigslist, making calls, cold calling, looking for work. It is a full time job, and if I were being paid for all of this hard and discouraging work, I’d be doing quite well for myself financially. Tahoe, my love, it might be nearing the time to say goodbye to you, to your daily beauty and inspiration, to the ultimate photo opportunities, to my favorite field of Lupine. It might be time to find a new place to hang my hat and call home, somewhere where I can find a job and make a living. Clare Foster is a Tahoe City resident.